Everyone’s always talking about time travel and Doctor Strange’s “end game” plan for Avengers 4, but two new theories attempt to unravel exactly how Princess Shuri of Wakanda might help defeat Thanos in the Avengers: Infinity War sequel. The new theories emerged over the weekend on the /r/FanTheories subreddit to explain Shuri’s increased role in the next Avengers movie. The first, by redditor hockeytalkie, assumes that after the events of Infinity War, Shuri figures out a way to revive the Heart-Shaped Herbs that Killmonger burned during Black Panther. The assumption is that Shuri will consume the Herb to become the new Black Panther, and in doing so visit the Ancestral Plane hoping to see her brother. “But what happens if T’Challa isn’t there?” this theory wonders. Their father, T’Chaka might even offer insight about how the good guys can defeat Thanos. T'Challa visits the Ancestral Plane during 'Black Panther'. So not only would Shuri become the Black Panther, but she’d relay this information to the remaining Avengers during the first act of Avengers 4, launching a convoluted mission to revive everyone. Here’s where a second theory comes in (from a redditor going by pluralizes) that’s even more interesting. 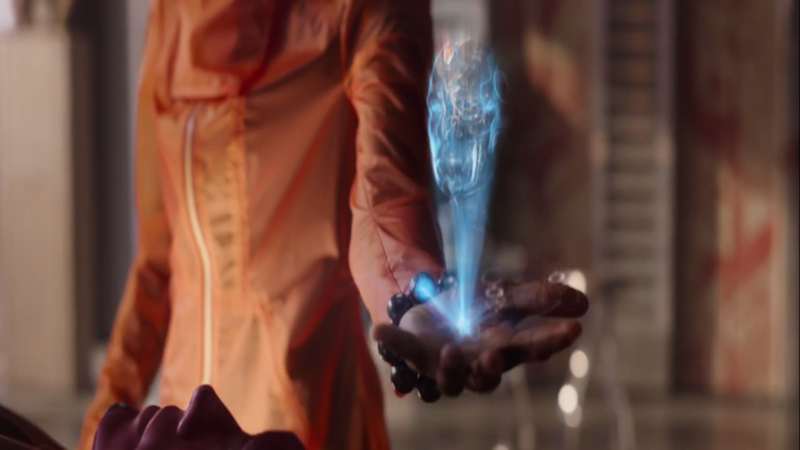 “What if it is revealed in Avengers 4 that during her study of Vision, Shuri backed up the interface of the Mind Stone?” Maybe her Wakandan technology is so advanced that she could manufacture a synthetic copy of the Mind Stone. Shuri already understands how Vision and the Mind Stone function better than anyone else. This theory then requires Ant-Man to introduce time travel via the Quantum Realm and for Tony Stark to go back in time to replace the Mind Stone in Loki’s Scepter with the synthetic one sometime around the events of the first Avengers movie. Several set photos indicate that there’s some kind of stick covered in tracking dots that was used as a prop at that point in the MCU timeline, and that object could very well be the Scepter. The assumption here is that the synthetic Mind Stone would function in the same way, giving the Maximoff twins their powers and helping create Ultron and Vision, but when Thanos tries to use it for the Snap, it doesn’t work at all in this new timeline. Not only that, but maybe the good guys have their own Infinity Gauntlet full of Stones taken from various points in time? This theory doesn’t go much further beyond that, but assuming that all this does happen, is it possible the Infinity Gauntlet might backfire on Thanos and destroy him outright? Could it create some kind of temporal paradox that resets the universe? Would the Infinity Stones just scatter across the universe like Dragon Balls, leaving Thanos to fend off the Avengers with just his innate strength? There’s no way of knowing if any of this is true, especially because we don’t even know for sure if Shuri even survived the Snap. Actress Angela Bassett, who plays Queen Mother Ramonda in the MCU, claimed in July that Shuri survived the events of Infinity War — but we don’t have any visual confirmation or even any set photo leaks showing Shuri. Still, we’ve got a feeling that Princess Shuri has a crucial role to play. We’ve just got to wait to for Avengers 4 to find out. Avengers 4 is due out in theaters on May 5, 2019.